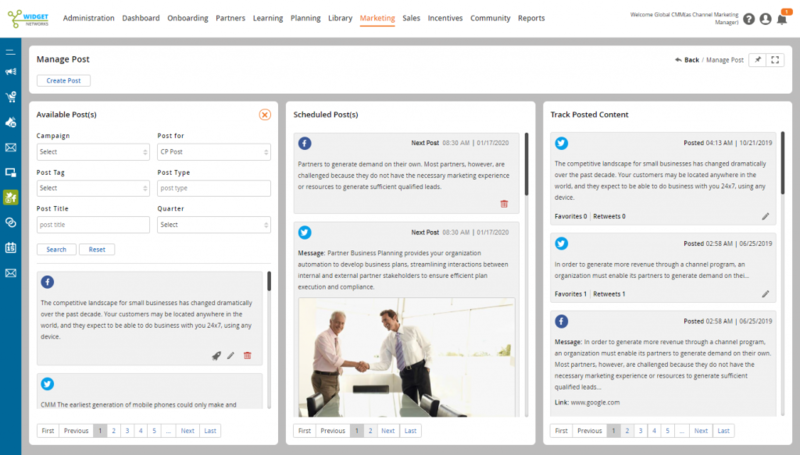 The Social Syndication Management module of ZINFI’s partner marketing management (PMM) platform enables your organization to syndicate social media content via your channel partner network. Partners can auto-stream or manually customize each social feed for either instant or delayed/scheduled posting. ZINFI’s Social Syndication Management module enables your organization to set up dynamic marketing content for partners to use in their marketing of products via social media platforms. This helps you and your channel network increase content reach with less effort. Our Social Syndication Management module includes in-depth analytics, which your organization and your channel partners can use to measure the effectiveness of specific distributed content. Using our content distribution scheduler, vendors and channel partners can save hours of time by automating complex distribution processes. Your organization and your channel partners can use the Social Syndication Management module to connect social accounts like Twitter, Facebook and LinkedIn with the ZINFI partner marketing management (PMM) platform. The integration of different platforms via a direct connector is an important feature of our Social Syndication Management module. This feature allows data to flow smoothly across diverse platforms, and provides your organization with instant, detailed insights into campaign results achieved with respect to each instance of shared content—all without having to visit individual channel partners’ social profiles. With the Social Syndication Management module, your organization can easily make marketing content available to channel partners for immediate use. Your partners can then choose a specific a date and time to post the content on their corporate social accounts to generate leads. The Social Syndication Management module also allows your channel partners to direct content viewers to their own customized, co-branded microsite embedded in the content. Our robust post scheduling management features give channel partners the flexibility they need in posting content with optimal timing.